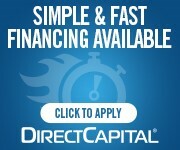 Gaging.com has partnered with Direct Capital to provide fast, reliable financing options online. Complete the simple 3-minute application and get the funds you need today! For twenty years, Direct Capital has offered small businesses competitive rates and an unparalleled customer experience. Direct Capital's LendEdge technology lets your business quickly and easily secure financing online.